Red Pepper Eggwich for my new RED site! Welcome to the all new Danica’s Daily! Doesn’t it look cool?! Zesty did an awesome job and I LOVE how it is looking so far. I have a few things I will be adding (tag cloud, links to follow me on, my about page, etc to get organized) over the next few weeks and I’ll be sure to let you all know as I complete them. * A Print this post button has been added so you can print any of my posts, including recipes to take with you! * Commenting should be easier (blogger shouldn’t eat your comments) AND the page errors should go away – yeah! If you find that your reader/subscription is not updating, you may need to update my address to drop the .blogspot and show www.danicasdaily.com. OMG ~ this spread tastes as amazing as it looks. I used this spread to top my toasted Thomas Double Fiber English Muffin (1 Weight Watcher Point). The next product was Big S Farms Tennessee Lightning Hot Sauce. I added this “spicy” sauce to my Egg White Fluffies to give them a little kick. Add it to my Thomas DF English Muffin smeared with the TJ’s Roasted Red Pepper Spread for an AMAZING Cheesy, Peppery, Eggwich for only 5 Weight Watcher Points! My camera battery actually DIED this morning so I didn’t get all my pictures in 🙁 I may just have to use my phone or borrow my co-workers camera for the day….bummer! Alright all ~ Enjoy the new site and have fun poking around! I am not sure if the Farmer’s Market or the Gym will win at lunch. Spinning kicked my bootie yesterday so I may opt for an easier workout today. mmmm that egg masterpiece is fab! AND i can make it thanks to the RP spread i have!! yay! Janetha ~ I was debating between this spread and hummus – this spread rocked the sandwich. You definitely NEED to try it! What an amazing looking sandwich! I love the new red! K – OMG, I totally need to try that! Now that you mention it, I bet it makes fantastic pizza sauce too! Your new website looks awesome! Very refreshing and streamlined. Great work! Robin ~ awww – thanks and I still am going to be making improvements too – yeah! This spread looks devine! I’m so sad I didn’t buy it now. I picked up the Roasted Eggplant instead and it is mighty tasty as well. Next on my list is the red pepper for sure! That looks amazing! Why bother eating out when you can make a great looking breakfast like that! Island Girl ~ I totally agree – it was a fantastic tasting breakfast and so easy to make too! It would take longer to drive somewhere and wait. Wow! LOVE the new look! Emily ~ Thanks – I LOVE it too! Love the new site! 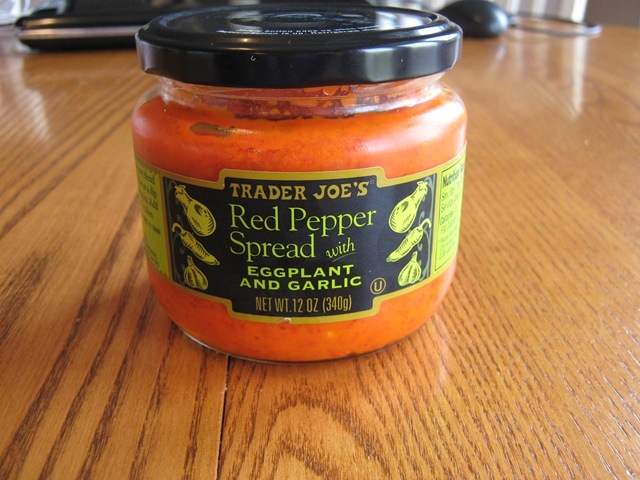 My mom is a huge fan of that TJ’s spread–we get a jar every time we’re in a city with a TJ’s! Caroline ~ Thanks, I am glad you like the new site. I can’t wait to get everything done I want so you all can enjoy it even more. The spread is awesome!